If you're reading this, thank you for your patience with my lack of posting. Life is still too hectic on the job front. One of my bosses was reassigned, and another announced his "retirement" effective that same day. Bad days where I work. Anyways, Round 2 of the tournament is almost finished. 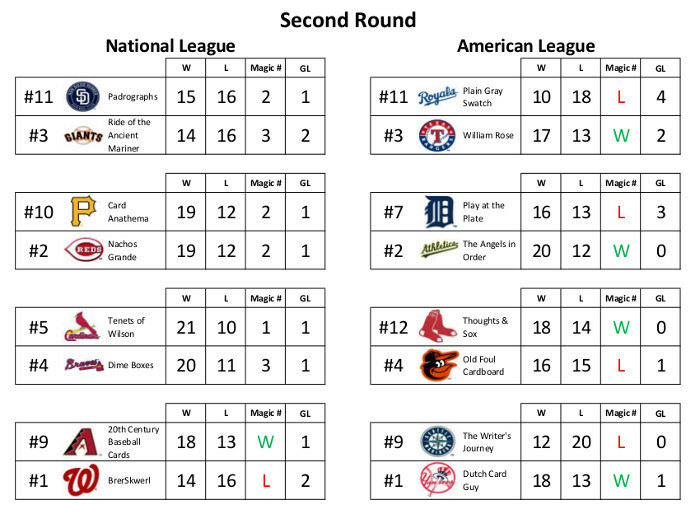 The AL is set with the Rangers (#3), A's (#2), Red Sox (#12) and Yankees (#1) making it into the next round. In the National League, only the Diamondbacks (#9) have punched their ticket. The remaining nail bitters will be decided tonight.